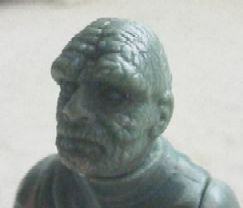 Shown here in comparison with a standard figure, it is truly amazing to see how The Emperor was first envisioned by Kenner when you look at this hardcopy. This stunning piece is made of Dynacast material and would have boasted a removable robe in addition to an incredibly detailed bald head. 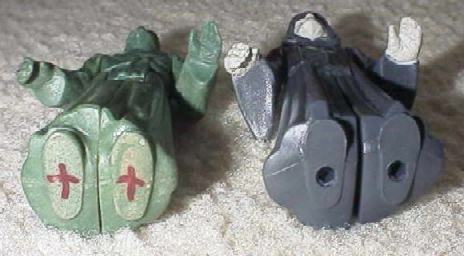 Since a cloth robe was to be used, the sculpted clothing on this figure is much "smaller" which is very apparent when compared to the production toy. 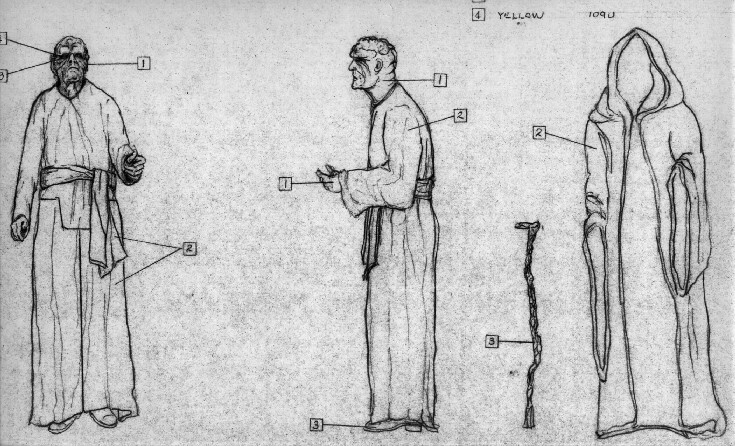 The image above is from the Kenner blueprint for the figure. The design was literally transferred to the figure in all aspects. Every part of the figure was resculpted before it was released to the public and the most likely reason for the change is that Kenner probably felt the figure would be too expensive to produce. Since the figure would initially be given away free during a mail-in promotion the additional cost of manufacturing and assembling a robe would have likely been too high. And kids would have probably never known the difference anyway. 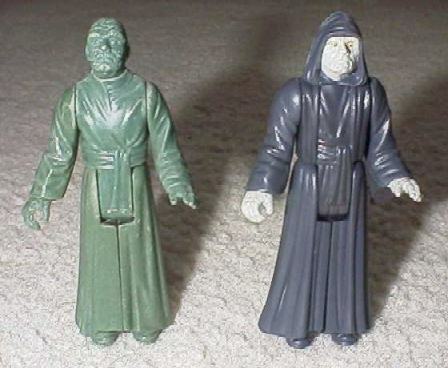 Then again, it is also possible that Kenner didn not feel like they could capture the true look of the character unless they had a robe that fit just right. 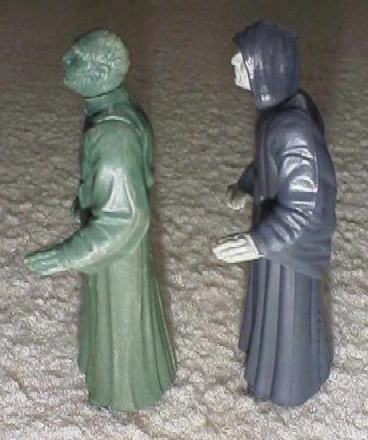 And without either the ability or desire to produce injection molded, sculpted, robes (like on today's figures) they probably had to settle for making it all as one piece. 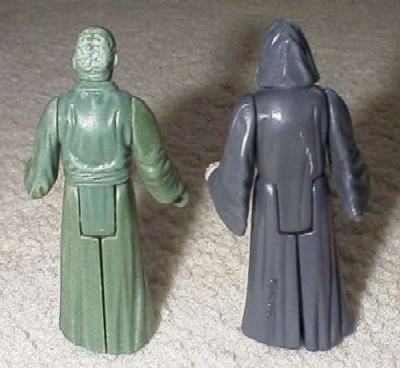 A cloth robe would probably have looked more like a poncho such as with the Prune Face or Luke Jedi Knight figures, but a poncho is not very sinister looking for the Galactic Emperor. Notice how the sleeves feature straight cuffs. Because it was decided that The Emperor would ultimately not have a robe accessory, the robe needed to be integral to the sculpting of the figure. The sculpted fabric on the legs and arms of the production figure was enlarged to give the effect of a robe. Notice also, the size of the sleeves, which were given large hanging cuffs, on the production figure. 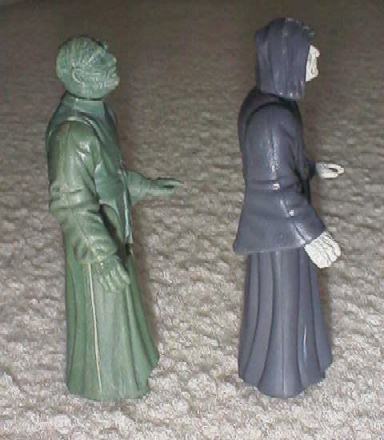 The position of the arms and the hands really were not altered on the production version, which makes sense since the cane would have still been an accessory for placement in the hand. The difference in the size and sculpting of the legs can really be seen when you look at the bottom of the figure. You can get a good glimpse of the sleeve cuffs in this shot as well. 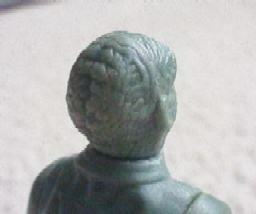 Of course, the head is what stands out the most on this figure. The detailing in the wrinkled skin is quite extensive as can be seen in these close-ups. 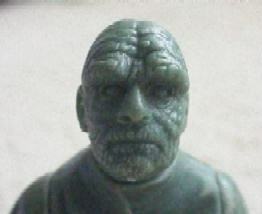 The general look of the face was altered a bit and the brow portion was reduced significantly for the production version. It is quite a treat when things like this surface since few examples of these "scrapped" ideas have managed to show up. This piece gives us a glimpse into some of the conceptual phases that Kenner designers and sculptors worked in and I am just glad that it survived for so long.